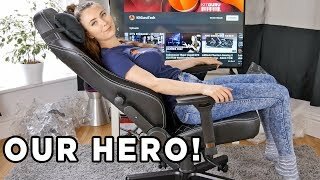 More links for "HERO Gaming Chair - Black/White"
The chair is fantastic. I work from home, so spend 8 hours a day in a chair in front of my machine. I needed a chair that was both comfortable and supportive and this chair provides both. It is exceedingly well designed and built (the chair weighs about 28 kilos, which should give you some idea of the material quality). Yes, it is pricey but as the saying goes "you get what you pay for" and if you spend a lot of time in your chair, the last thing you want is back pain caused by bad posture. You need something that is comfortable and will last and this chair will most certainly do that. 5/5, you cannot get anything better. I love the quality of this chair. I love the colour match on this chair, the white stitching goes perfectly with the black covering. It really is striking and stands out! I love it! Thanks oc for the fast delivery too! 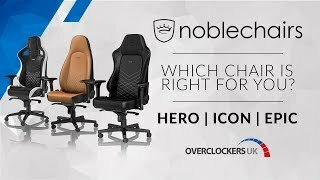 I am impressed with the quality of noblechairs, I bought an epic series before and I have passed this one onto my wife and gone with the hero. I absolutely love both models and can highly recommend them! If you're wanting a gaming chair that's going to last, and give you comfort, then look no further!